Add on-trend colour to your outerwear. 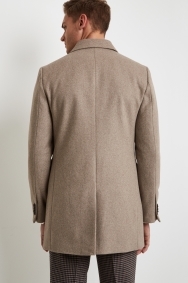 With its subtle oatmeal shade and slim fit, this overcoat will turn heads on cooler days. The oatmeal shade is the ideal partner for dark seasonal colours and will look great over smart-casual outfits and sharp business suits. 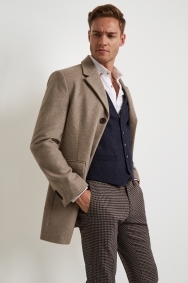 It features a notch lapel, dark brown buttons and a contrast pale grey undercollar, so your style will always be at the forefront of your outfit. 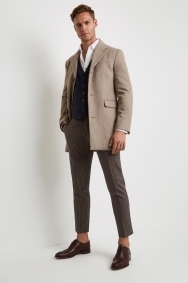 For a stylish outfit, throw it over puppytooth check trousers, a white shirt and a blue slim fit waistcoat, and finish with polished brown Derby shoes. 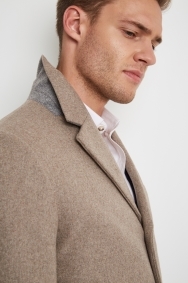 One of my fav over-coats ever! The Jacket is such good quality. Didn't even think to look in Moss Bros until I saw it in the shop window. Exactly what I was looking for and even better - it was in the sale. Looks better on screen. Not a very nice colour. Bought the bigger size so did not fit well. Good style and quality though. Perfect fit for my dad and he loves it! 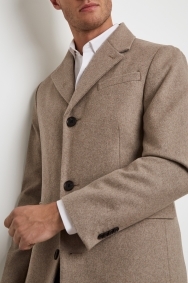 The coat is of lovely quality materials and fits perfectly. The style is slightly fitted and looks very good on. 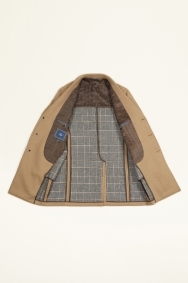 Looks great on hanger but not a great cut (albeit it is a over coat).